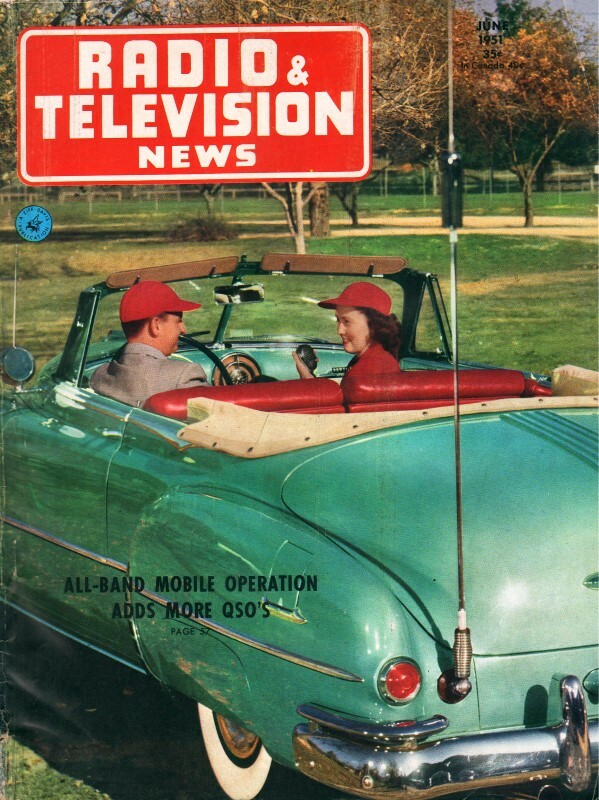 Radio & Television News magazine was not normally in the practice of instructing retail outlet salesmen and service shop owners in techniques for hacking their wares, but this article in the June 1951 issue of Radio & Television News is an exception. In it, A.W. Bernsohn, Managing Director of the National Appliance & Radio Dealers Association, extensively outlines many tried and true schemes for use in convincing customers that they really do need a new, reconditioned, or rental portable radio for those lazy, hazy, crazy days of summer*. 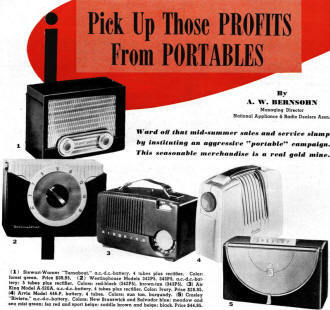 Those were the days long before iPods, Walkmans, and smartphones, when 'portable' meant maybe smaller than a breadbox, but powered by batteries rather than an AC outlet. If any of the featured models appeal to your sense of nostalgia and you want to lay you hands on one again, try eBay; eventually just about everything shows up there (do a Saved Search if necessary to get an e-mail notification when one is available). M. Bensohn even covers the ramification of Regulation "W" of the Federal Reserve Act which has been around (even today) since 1933. *Audio: "Those Lazy, Crazy, Hazy Days of Summer" by Nat King Cole. 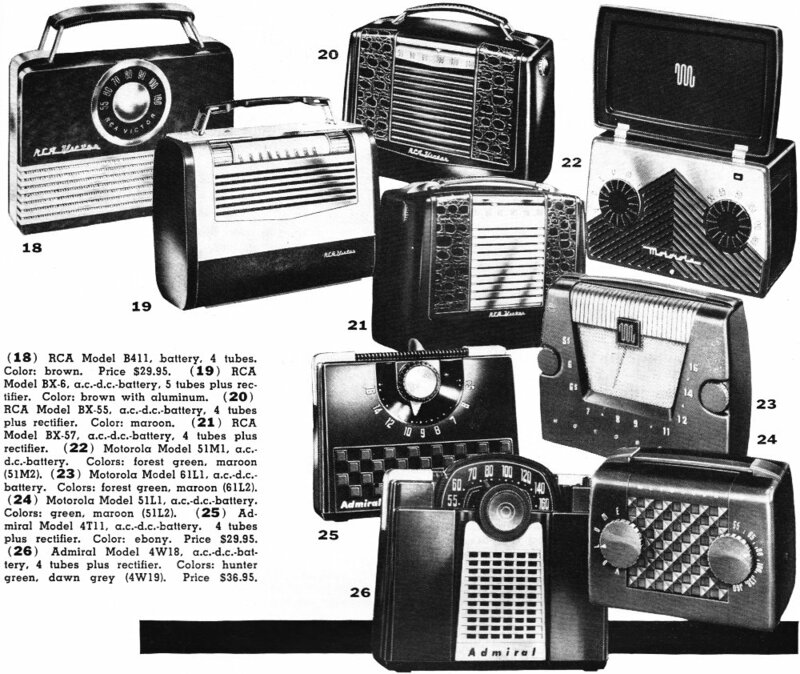 National Appliance & Radio Dealers Assn. (1) Stewart-Warner "Turnabout" a.c.·d.c.-battery. 4 tubes plus rectifier. Color: forest green. Price $39.95. (2) Westinghouse Models 342P5, 343P5. a.c.·d.c.-battery; 5 tubes plus rectifier. Colors: red-black (342P5). brown-tan (343P5). (3) Air King Model A-520A. a.c.-d.c.-battery. 4 tubes plus rectifier; Color: Ivory. Price $28.95. (4) Arvin Model 446-P, battery, 4 tubes. Colors: sun tan, burgundy, (5) Crosley "Riviera" a.c.·d.c.-battery. Colors: New Brunswick and Salvador blue; meadow and sea mist green; fez red and sport beige; saddle brown and beige; black. Price $44.95. Ward off that mid-summer sales and service slump by instituting an aggressive "portable" campaign. This seasonable merchandise is a real gold mine. 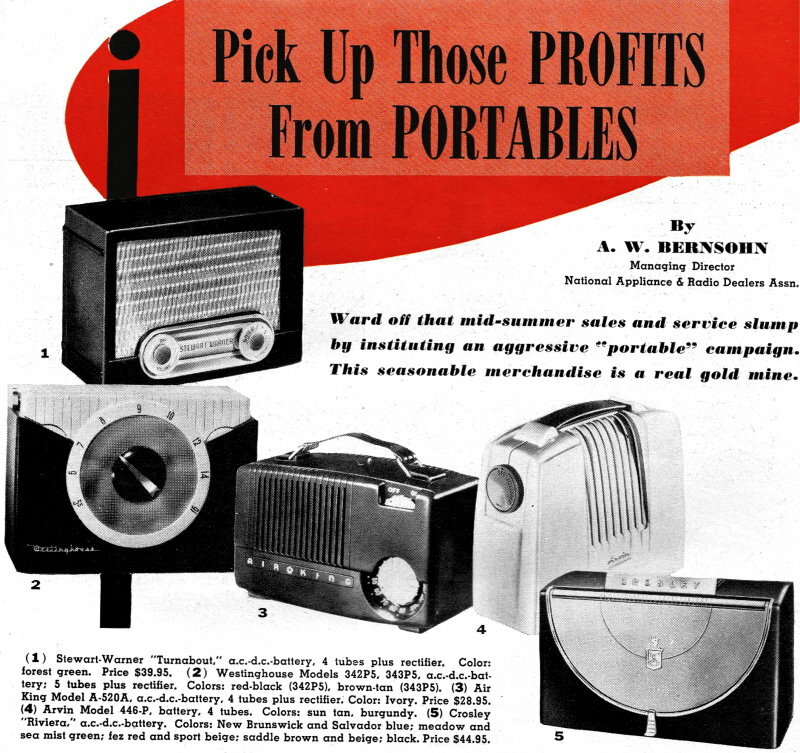 As the brightest hope for relief from the traditional summer slump in radio service and sales, pick up those profits from portables! Every year the servicing and sales fraternity is reminded of this profitable source of revenue but the man who goes out and gets his full share of the business is as rare as winning a five-horse parlay. Here's a check list of ideas. Not all of them will apply to your business but chances are that you'll find some that will fit and others that will start you thinking of adaptations that can be made to tailor them to your requirements. 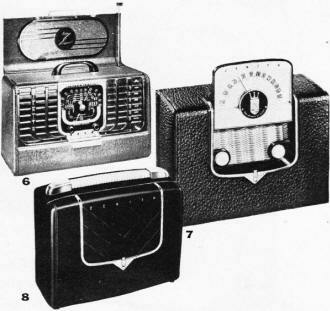 Editor's Note: Unless otherwise stated, all portable receivers shown in this article cover the standard broadcast band. Prices, where quoted, do not include batteries and are those prevailing in the central and eastern sections and are subject to change. For southern and Pacific Coast areas, prices may be higher because of the differential in shipping charges prevailing. There are 8 1/2 million portables in use today, ranging in age from this season's purchases to receivers that have passed their fifth birthday. Not many of the receivers made before 1947 are still around but that doesn't mean that there isn't plenty that can be done along the servicing line even with these newer sets. This large number of portables in the hands of the consumer means almost unlimited service opportunities for the summer months, since such check-ups usually result in battery sales, tube replacement, and both major and minor service jobs. It is business well worth going after! Since the portable is going places and will be subjected to the roughest treatment given almost any receiving equipment in civilian use, it is important that all solder joints be firm and the whole repair job be heavy duty. If you do a creditable job on repairing portables, you'll get plenty of business - word-of-mouth advertising is a powerful sales medium and a satisfied customer can give your portable business a real shot-in-the-arm. The technician's selling job also includes the task of persuading the vacationer that since his portable will be his good and constant companion throughout the summer it is deserving of a thorough check-up at the same time that his fishing tackle and golf clubs receive their seasonal going over. (6) Zenith Model G500. a.c.-d.c.-battery, b.c.-s.w., 5 tubes plus rectifier. Color: black. Price $114.25. (7) Zenith Model G503. a.c.-d.c.-battery. 5 tubes plus rectifier. Colors: brown, black. Price $49.95. (8) Zenith Model 4G903, a.c.-d.c.-battery. 4 tubes plus rectifier. Colors: blue, grey, black. Price $39.95. (9) Hallicrafters Model 5R24. a.c.-d.c.-battery. 4 tubes plus rectifier. Color: oyster grey. Price $34.95. (10) Hallicrafters Model S-72L. a.c.-d.c.-battery, all-wave. 8 tubes plus rectifier. Color: brown. Price $119.95. (11) Emerson Model 646. a.c.-d.c.-ballery.4 tubes plus rectifier. Colors: maroon, saddle tan, green, ivory. Price $29.95. (12) Emerson Model 656. a.c.-d.c.-battery. 5 tubes plus rectifier. Colors: maroon, sand. Price $39.95. (13) Emerson Model 657. a.c.-d.c.-battery. 5 tubes plus rectifier. Color: simulated alligator. Price $44.95. 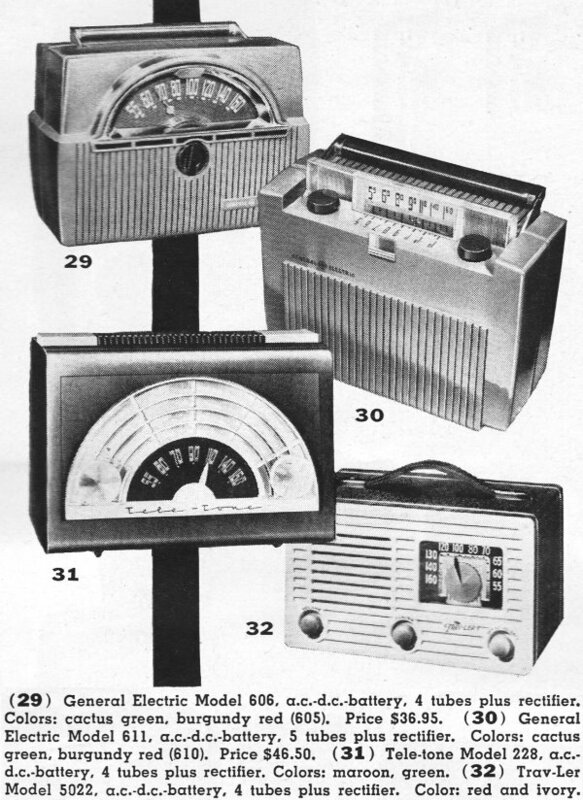 (14) Philco Model 631. a.c.-d.c.-battery. 4 tubes plus rectifier. Colors: teal green, maroon, Caribbean blue, Swedish red. Price $39.95. 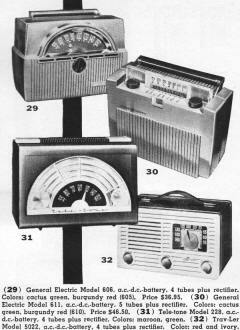 (15) Philco Model 633. a.c.-d.c.-battery. 5 tubes plus rectifier. Color: genuine cowhide. (16) Philco Model 629. a.c.-d.c.-battery. 4 tubes plus rectifier. Colors: teal green, maroon, Price $34.95. (17) Philco Model 632. a.c.-d.c.-battery. 4 tubes plus rectifier: Color: maroon plastic with brass trim. Price $49.95. (18) RCA Model B411 battery, 4 tubes. Color: brown. Price $29.95. (19) RCA Model BX-6, a.c.-d.c.-battery, 5 tubes plus rectifier. Color: brown with aluminum. (20) RCA Model BX-55. a.c.-d.c.-battery, 4 tubes plus rectifier. Color: maroon. (21) RCA Model BX-57. a.c.-d.c.-battery, 4 tubes plus rectifier. (22) Motorola Model 51M1 a.c.­d.c.-battery. Colors: forest green, maroon (51M2). (23) Motorola Model 61L1 a.c.-d.c.-battery. Colors: forest green, maroon (61L2). (24) Motorola Model 51L1 a.c.-d.c.-battery. Colors: green, maroon (51L2). (25) Admiral Model 4T11 a.c.-d.c.-battery. 4 tubes plus rectifier. Color: ebony. Price $29.95. (26) Admiral Model 4W18. a.c.-d.c.-battery. 4 tubes plus rectifier. Colors: hunter green, dawn grey (4W19). Price $36.95. (27) Sentinel Model 335-P. a.c.-d.c.-battery. 4 tubes plus rectifier. Colors: white (PI), brown (PW), forest green (PG), red (PM). 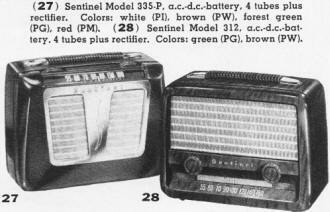 (28) Sentinel Model 312. a.c.-d.c.-battery. 4 tubes plus rectifier. Colors: green (PG), brown (PW). (29) General Electric Model 606. a.c.-d.c.-battery. 4 tubes plus rectifier. Colors: cactus green, burgundy red (605). Price $36.95. (30) General Electric Model 611 a.c.-d.c.-battery. 5 tubes plus rectifier. Colors: cactus green, burgundy red (610). Price $46.50. (31) Tele-tone Model 228. a.c.-d.c.-battery. 4 tubes plus rectifier. Colors: maroon, green, (32) Trav-Ler Model 5022. a.c.-d.c.-battery. 4 tubes plus rectifier. Color: red and ivory. (33) Jewel Model 5050. a.c.-d.c.-battery. 4 tubes plus rectifier. Color: ivory and maroon. (34) Mitchell Model 1256. a.c.-d.c.-battery. 4 tubes plus rectifier. Color: maroon. Price $39.95. (35) Fada Model P111. a.c.-d.c.-battery. 4 tubes plus rectifier. Colors: ebony (E), maroon (M), ivory (V). (36) Fada Model P-130. a.c.-d.c.-battery. 3-bands. 4 tubes plus 2 rectifiers. Color: two-tone simulated leather. One of the most effective methods of attracting portable business is to offer a flat-rate service charge, listing all of the features of such a check-up. Such services could include thorough tube, battery, and wiring inspection, a complete operational test, and cleaning. Some service dealers make arrangements with their neighborhood shoe repair men to replace the worn leather handles on portables. Don't forget that the more attractive and comprehensive you make this list, the greater your chances for attracting volume business. Ways of presenting this message to prospects are only limited by the ingenuity of the technician. A postcard mailing to all past portable customers is good for the medium sized, self-servicing dealer, especially if a double postcard is used so that all the customer needs to do is check a square and sign his name. P.S. If you haven't selected your portable radio as yet, you can get one here for as little as $00.00. A large sign in your shop window advising prospective customers that you are equipped to handle portable sales and service is an inexpensive way of stimulating business and has the additional advantage of cutting down on pick­up and delivery expense. Handbills and postcard mailings to names in the telephone directory are also good catch-alls, although admittedly less effective than pin-point selling. Look over the advertisements being run by the manufacturers on their new portables. You can adapt many of their proven ideas to the selling of service. One critical consideration in portable servicing is your tube supply. Before setting up any large scale campaign, check it carefully and secure tube substitution charts from the manufacturers covering tubes in short supply. Lack of these replacements may prove to be your principal handicap and the more fully you anticipate these difficulties, the less likely is it to impede a successful campaign. In reviewing portable servicing possibilities, remember to remind your vacationing customers to take along an extra set of batteries. Failure to do so may cost you a good customer in case his receiver gives up the ghost in some remote spot. When the customer is having his portable reconditioned is the perfect time to make this suggestion. Since many portables are listed at less than $50, the restrictions of Regulation "W" covering rentals and sales do not apply. This means that there is nothing to keep you from renting portables if you wish and then later converting them to sales by permitting the prospect to apply the rental fee as a down payment or full purchase price on the set. 1. There must be sufficient prospect for demand to justify tying up the merchandise for the season. 2. There must be some way to prevent theft of the portables or loss through irresponsible treatment of the set by the renter. In hotels, arrangements may be made to have the portable returned and checked at the time the guest checks out. Similarly, you are reasonably safe at watering places where the renter has a locker or at country clubs where he is a member. For rentals in public places, it is best to demand full identification and/or substantial security. 3. There must be sufficient free time for the renter to make use of the portable. In some areas, such as camps and hotels with pre-planned activities, adequate leisure is too much of a rarity to make portable renting profitable. 4. There should be a large enough number of sets in use to make the project worthwhile from the collection, bookkeeping, and maintenance standpoint, to cover the inevitable losses on some rentals and to pay a reasonable percentage of the receipts (seldom less than 25 per-cent and often as high as 50 per-cent) to the attendant to whom the rental receivers have been entrusted. Don't overlook the possibilities of handling rentals from your place of business as it brings likely prospects into your store. When you go into the rental business prepare for night work and early morning deliveries unless you have a good stock of replacement sets on hand. These must be kept in good condition otherwise you will discourage the agencies which handle the renting of your portables and the whole business will go to pot in a hurry. Frequently the outlying retailer or the small service shop can bring in extra revenue by placing a few portables on consignment in outlets which would not normally have sufficient demand for this type of merchandise to warrant their carrying a full line of receivers. Typical of these outlets are luggage shops, travel agencies, hotel lobby gift stands, concessions in railroad stations, and gasoline stations. Warning: The vendor will expect a good part of the profits on consignment merchandise, so use this selling method only when you have a generous supply of portables and personals on hand. While the appeal of this activity fluctuates with the success of our armies in the Far East, it does present an exceptional opportunity for portable sales when and where there is the greatest interest in civilian defense. Most official publications recommend that the civilian defense worker have a portable, battery-operated radio receiver in case of power failure. The widespread use of such receivers gives the civilian defense activity its most efficient means of mass communication. Check with your local defense program. Find out who is in command and what local interest has been aroused. Post a special offer for civilian defense workers, offering a free receiver to the defense unit that purchases a certain number of receivers. It could provide a lively and profit­able source of business. 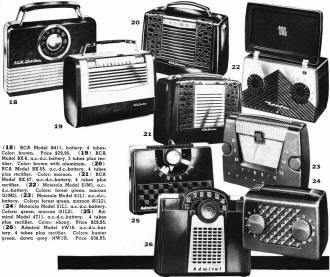 Ever since they first became a significant factor in the radio business portable receivers have constituted a good source of revenue. In the past four years these little receivers have been responsible for more than a quarter-billion dollar's worth of retail volume! Hardly a sum to be ignored. There are various ways of stimulating portable business. In one major city during the World Series, Western Union messengers were equipped with portable receivers, playing at a healthy volume and carrying a punchy advertising message of course, and turned loose on the city streets, walking slowly where the sidewalk traffic was the heaviest. These "live" advertising messages attracted surprisingly large crowds and one messenger was seen walking down the street followed by some 40 people during one particularly exciting inning! When a department store conducted a sales drive on portables two years ago, they featured this merchandise in their luggage departments and the sales went up a surprising 13 per-cent over the previous year's record sale volume. 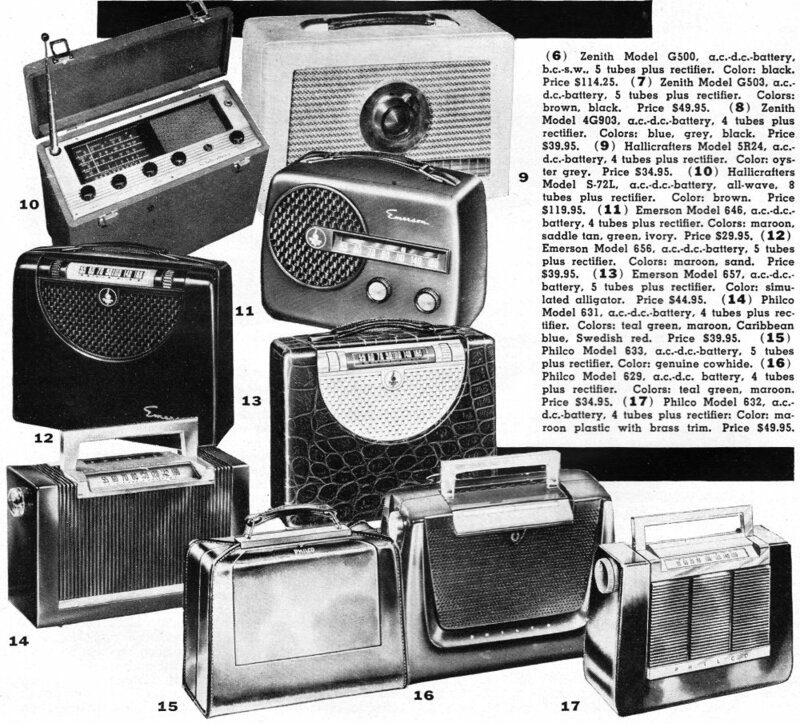 One New York radio retailer set up an entire window display of portables Each receiver carried a price tag and were arranged in an ascending price scale. Despite the fact that there was no promotional material in the window other than the sets themselves, in three days he had sold 57 units at an average of $47.50. In 1951, designers and manufacturers have surpassed their efforts of previous years in developing portable merchandise that is lightweight, strikingly attractive, and reasonably priced. The opportunity was never greater nor the incentive stronger than now to go to work repairing and selling these units.